Do you ever have those nights when you realize that you forgot to plan ahead for dinner? 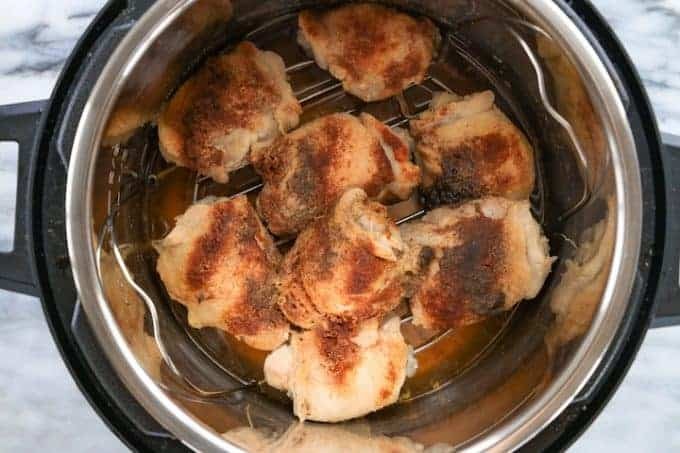 This Instant Pot Frozen Chicken Thighs recipe is going to be a life-saver! In under 30 minutes, you can transform frozen chicken into a hot & tasty dinner meal. I tend to cook with chicken thighs because they are the most tender cut of chicken and far cheaper than chicken breasts. Plus, my kids prefer the juicy flavor of chicken thighs. For this recipe, I use bone-in chicken thighs but boneless chicken thighs could be substituted if you prefer. 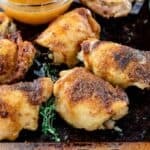 I typically serve this chicken thigh recipe with my Zucchini Crisps and even mix up a batch of my Double Chocolate Brownies for dessert! 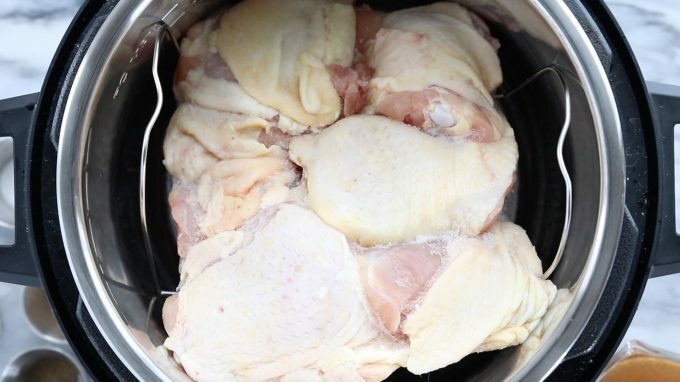 Follow the step-by-step directions in this video to make Instant Pot Frozen Chicken Thighs. Place the cover on the Instant Pot and make sure it is set to sealing. 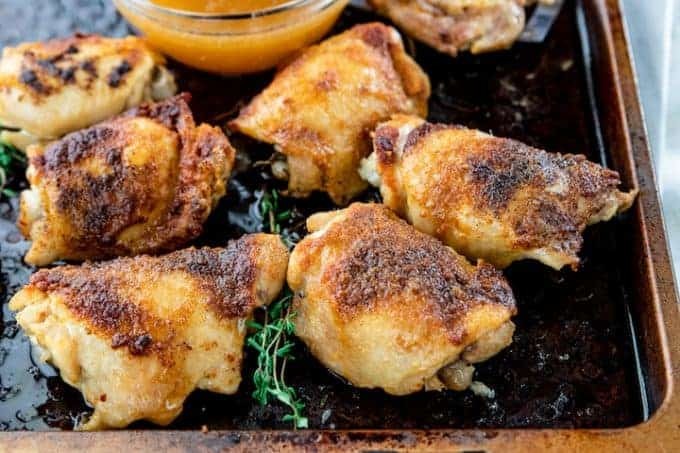 For crispy skin, place chicken thighs onto a baking sheet, brush lightly with oil and broil for 3 minutes or until the skin crips and starts to brown. Serve immediately after broiling. Cook on high heat for 4-6 hours or until internal temperature reaches 165 degrees. Start by placing the rack that came with your Instant Pot in the bottom of the pot. Then, add your frozen chicken thighs. 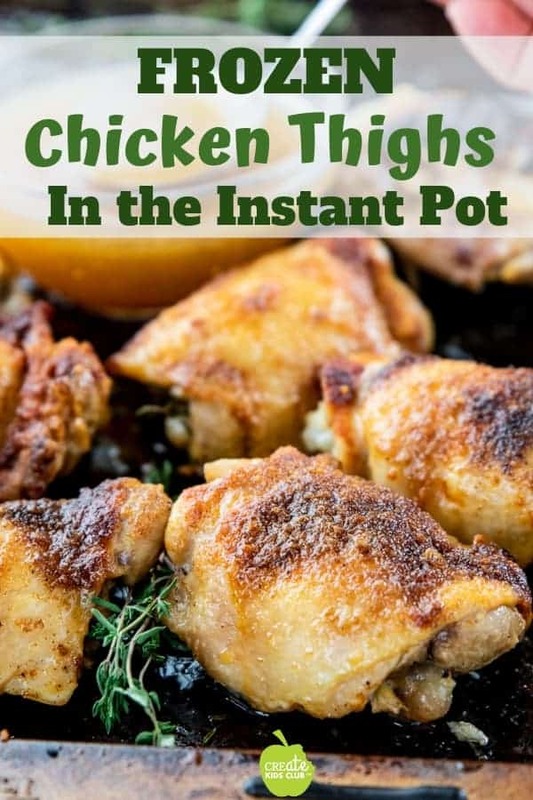 PRO TIP: If the chicken thighs are frozen together, set them on an angle in the Instant Pot. They will cook just fine! Next, add the broth & spices. After the spices have been added, cover and set the Instant Pot to “SEALING“. 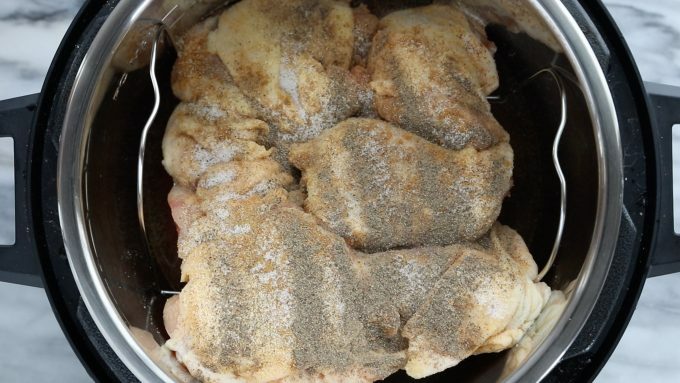 Cook chicken thighs on high pressure for 30 minutes. SHOULD I USE NATURAL PRESSURE RELEASE (NPR) OR QUICK RELEASE (QR)? NPR is when you let the Instant Pot release the pressure naturally. The pressure will release slowly & the lid will unlock when the float valve drops completely. With QR, you manually turn the valve from “SEALING” to “VENTING”, which will let the pressure go quickly. Be cautious with QR because the steam will shoot out of the top. For this recipe, I often use quick release because I do not want to wait for the natural pressure release. However, either release option will work. DO YOU ALWAYS BROIL THE CHICKEN AFTER COOKING? DO YOU ADD A SAUCE TO THE CHICKEN? Honestly, it depends on the night and my family’s request. I will either drizzle a sauce on top of the chicken thighs or serve on the side. 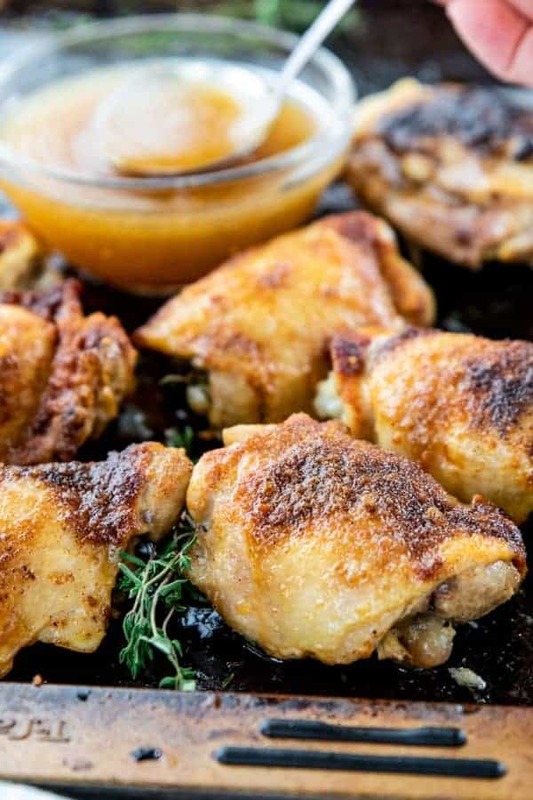 I love to turn this recipe into a BBQ chicken pressure cooker recipe by tossing the cooked chicken in a Homemade BBQ Sauce. The Instant Pot has changed the way that I cook dinner because of how quick & easy the recipes are to make. Plus, my family is always impressed with the delicious food that is served. Thank you for these instructions- cooking from frozen will save so much time!